How was your weekend? Mine went well...I was really productive so it flew by fast! I was inspired by do a look using Yaby Cosmetics. Many YouTube Beauty Gurus have recently picked up some of the Yaby shadows online and at IMATS and have been raving about them so much that I decided to break out my Yaby Something Bright and Best of Both Worlds palettes. I've accumulated a good collection of eyeshadow palettes and this one has taken a back seat to them until now. I honestly forgot how much I love these shadows! They are a combination of matte, shimmer, glitter, and satin and are very pigmented and apply beautifully. The tiny shadows run about $2 a pop so you can pick and choose your favorites and stick them into Yaby's many palettes. I wanted to do a look that I thought many of you would like. Pink and purple seems to be a pretty popular combination. I didn't do anything crazy, I wanted to keep it simple. I can't believe that just a year ago I used to say that I hated pinks and purples on me. That of course, was before my discovery of MUFE no 92 eyeshadow. Since then, my eyes have been opened and I too love this girly combo. If you would like me to do a tutorial on this look, please let me know, it's super easy! -Begin by applying Steelo Medium Eyeshadow base to entire lid. Make sure to blend out the edges. -Pack on Shimmery White eyeshadow to tear duct/inner lid and browbone with a flat shader brush. -Apply light pink eyeshadow next to white shadow on inner lid with the same brush. You can pack this on so that you can see the light pink separate from the white. Just make sure to blend the line between the two. -Apply medium pink eyeshadow to the rest of the lid onto the outer v and a little bit above the crease using the same brush. Apply lightly with feather strokes because this is a super pigmented matte color...you just want a medium wash of color. -Take a pencil brush and apply a violet color to the inner part of the outer v...concentrating the color into the corner. -Line eyes with black kohl pencil. -Take an angled brush and shimmery purple eyeshadow and place it right on top of the black liner to give it a reflective purple sheen. 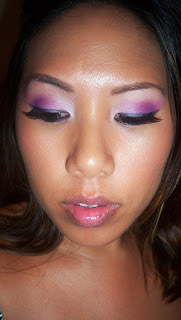 -Take angled brush, dampen with mixing medium, apply same purple shadow and line the lower lashline. -Apply black kohl pencil to waterline and a little bit on outer edge of lashline to darken the color. -Curl lashes, pop on some lashes, apply mascara and you're done! You can find Yaby Cosmetics at Camera Ready Cosmetics or directly from the Yaby Site. I'm thinking of doing more Yaby looks. Let me know if you have any look recommendations. Don't you love when you discover an old product and fall in love with it all over again? This is a gorgeous look! This is a gorgeous look and I definitely want to see the tutorial for it. please do a tutorial! this look is awesome! gorgeous purples! great fotd per usual! 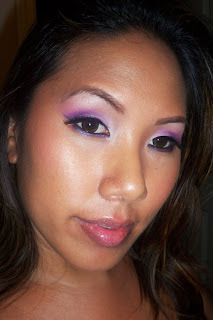 Stunning, I love the various shades of purple and the blend of pink; it's kinda like the hello kitty look from MAC.